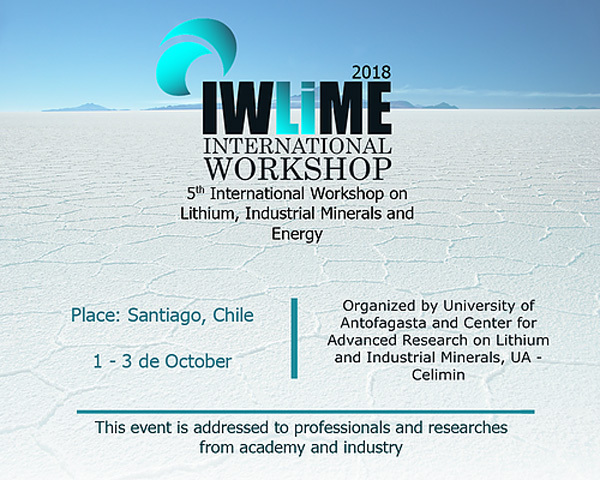 CIDETEC Energy Storage will be the guest speaker at the 5th International Workshop on Lithium, Industrial Minerals and Energy (IWLiME 2018), which will be held in Santiago de Chile from 1 to 3 October 2018. The aim of this international workshop is to present the most recent activities in research and development in the region and around the world in relation to industrial and strategic minerals, with a particular focus on lithium and battery technologies. The workshop seeks to strengthen and build new national and international collaboration networks between industry and researchers from academic institutions, by promoting applied research from universities in the region and around the world. The event is sponsored by several key companies in the region such as Albemarle, which is dedicated to the extraction, processing and supply of materials for ion batteries, among other applications. Oscar Miguel Crespo, director of CIDETEC Energy Storage, will speak on behalf of CIDETEC and present the latest R&D advances in lithium-ion batteries with his talk entitled "Research Trends in Lithium-Ion-Based Batteries". This invitation gives continuity to the visit made by the president of the workshop, Prof. Mario Grageda, director of the Center for Advanced Research in Lithium and Industrial Minerals (CELiMIN), belonging to the University of Antofagasta, to CIDETEC Energy Storage at the end of 2016, where he learned fist-hand about the centre’s activities, which are closely aligned with the theme of the event.